Chrys pulls together a comprehensive array of articles relating to the anti-vax debate. I’ve written two blog posts on anti-vax campaigner, Judy Wilyman (aka Roslyn Judith Wilyman) and, kindly, in return, she’s written a malevolent little missive about me which I found hugely entertaining. Not too long ago, Ms Wiley’s shenanigans were featured in a front page article in the Illawarra Mercury. I can’t imagine who might have tipped them off! 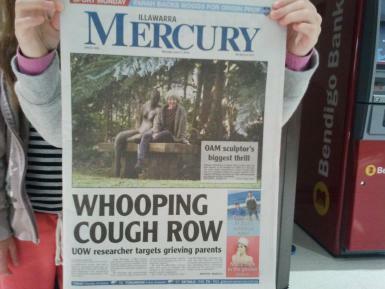 My first blog post about this rogue researcher – Judy Wilyman, PhD candidate, Wollongong University ‘false, dangerous, misleading and disrespectful’, castigates Wilyman for a callous attack on the parents of a baby girl who died of pertussis (whooping cough). The second, Why Wollongong’s abdication of responsibility for Wilyman won’t wash, criticises Wollongong University for their failure to censure Wilyman for unethical actions. It seems to me, Robyn, that before more research is done on the subject parents do really have no choice but to get their kids vaccinated. But I am all for it that proper research is done. It seems to me also that researchers should publish their results only after they’ve come to a conclusion they can agree on, otherwise it’s too confusing for the public. I wished for instance government would support research on fluoride. I am not convinced that it is a good idea to add fluoride to all our water! And as far as junk food is concerned I think more could be done to discourage people from eating too much junk food and promote more the eating of healthy food. I remember when my second brother was only three weeks old he suffered from whooping cough. (This goes back to 1941!). Mum took him to the doctor who advised to let him stand in his pram well covered with blankets outside on the balcony to breathe the fresh air. It was the middle of November and already quite cold in Berlin. Mum later said she felt bad about it leaving him outside in the cold air. But she said it worked. The baby soon got better. Maybe just breathing clean, fresh air helped? We have a tendency to underestimate the severity of these diseases because we haven’t had an outbreak for so long. However, coming from a country, like my husband does, where THOUSANDS of children die every year from preventable diseases, one tends to look deeply into the evidence and the experience of the professionals in the field. I think your second brother might be a very strong physical specimen and I so very glad he survived! 🙂 Back in those days, treatments were whatever they could be. Agree with you 100% on the junk food and I do hear there is talk of taxing junk food in order to make fresh food a cheaper alternative. I have read of poor areas in the USA where it is almost impossible to buy fresh food: clearly that is a major concern.